Enzyme Linked Immunosorbent Assay (ELISA) is a very sensitive immunochemical technique which is used to access the presence of specific protein (antigen or antibody) in the given sample and it’s quantification. It is also called solid-phase enzyme immunoassay as it employs an enzyme linked antigen or antibody as a marker for the detection of specific protein. An enzyme conjugated with an antibody reacts with a colorless substrate to generate a colored reaction product. A number of enzymes have been employed for ELISA, including alkaline phosphatase, horseradish peroxidase, and B-galactosidase. An immune reaction i.e. antigen-antibody reaction. Enzymatic chemical reaction i.e. enzyme catalyses the formation of colored (chromogenic) product from colorless substrate. Signal detection and Quantification i.e. detection and measurement of color intensity of the colored products generated by the enzyme and added substrate. A number of variations of ELISA have been developed, allowing qualitative detection or quantitative measurement of either antigen or antibody. The indirect ELISA detects the presence of antibody in a sample. The antigen for which the sample must be analyzed is adhered to the wells of the microtiter plate. The primary antibody present in the sample bind specifically to the antigen after addition of sample. The solution is washed to remove unbound antibodies and then enzyme conjugated secondary antibodies are added. The substrate for enzyme is added to quantify the primary antibody through a color change. The concentration of primary antibody present in the serum directly correlates with the intensity of the color. The sandwich ELISA is used to identify a specific sample antigen. 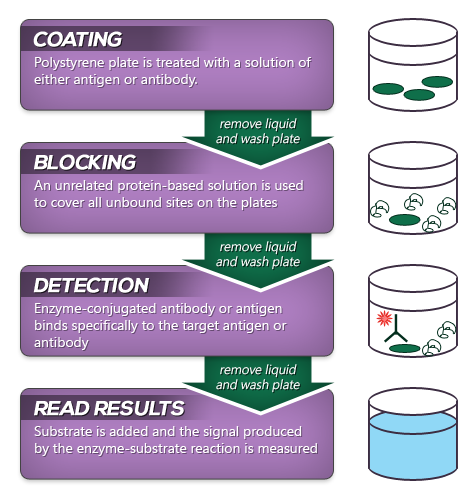 The wells of microtiter plate are coated with the antibodies. Non-specific binding sites are blocked using bovine serum albumin. The antigen containing sample is applied to the wells. A specific primary antibody is then added after washing. This sandwiches the antigen. Enzyme linked secondary antibody is added that binds primary antibody. Unbound antibody-enzyme conjugates are washed off. The substrate for enzyme is introduced to quantify the antigens. High specificity because the antigen/analyte is specifically captured and detected. Suitable for complex (or crude/impure) samples as the antigen does not require purification prior to measurement. Flexible and sensitive, both direct or indirect detection methods can be used. This type of ELISA depends on the competitive reaction between the sample antigen and antigen bound to the wells of microtiter plate with the primary antibody. First, the primary antibody is incubated with the sample. This results in the formation of Ag-Ab complex which are then added to the wells that have been coated with the same antigens. After an incubation, unbound antibodies are washed off. The more antigen in the sample, more primary antibody will bind to the sample antigen. Therefore there will be smaller amount of primary antibody available to bind to the antigen coated on well. Secondary antibody conjugated to an enzyme is added, followed by a substrate to elicit a chromogenic signal. Concentration of color is inversely proportional to the amount of antigen present in the sample. It is highly sensitive even when the specific detecting antibody is present in relatively small amounts.